Flight BY2453 was a charter flight from Malta to Manchester. The aircraft, with a capacity for 189 passengers, had 136 passengers, 2 pilots and 4 cabin crew on board. The load sheet recorded a takeoff weight of 65.6 tonnes and a centre of gravity of 23.4%. The pilots elected to take off from intersection F for runway 13 and calculated the following speeds for takeoff with Flap 10: V1 141 kt, VR 142 kt and V2 145 kt. Stabiliser trim was set to 4.5 units based on the load sheet information entered into the Flight Management Computer (FMC). Although not certain, the crew believe that all the passengers sat in their allocated seats. The takeoff acceleration was normal. At VR, the commander, who was pilot flying (PF), pulled back on the control column, but no rotation occurred with the normal pull effort. The PF continued to pull back and then with approximately ¾ elevator deflection the aircraft started a slow rotation. The aircraft was airborne with approximately 300 m of runway remaining. Once the aircraft was safely climbing away the PF applied rearward trim to remove the control force. The flight proceeded without further incident. The aircraft took off with incorrect stabiliser trim set because an incorrect CofG was shown on the load sheet. This occurred because the seating position of the passengers was not passed to the handling agent. 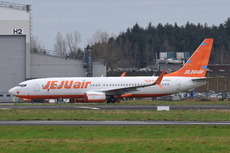 The handling agent assumed an even distribution of passengers within the cabin, when the actual loading created a forward bias.